A Holga 120 medium format plastic camera is all about simplicity. Purity. Inexpensive and fun. It doesn’t have a lot of the bells and whistles of modern cameras. This is definitely true when it comes to shutter speed. Shutter speed on a camera is about the length of time a shutter stays open. If it stays open a long time, a lot of light comes in, which is nice in low-light situations. It also means the image can blur, though, because things can move during that time. A fast shutter speed is great for high-speed situations like racecars zooming by on a track. However, only a small amount of light gets in, so that can end up with a dark image. With the Holga 120, you don’t have to worry about those sorts of things, because you only have two choices. One is the standard setting which is 1/100th of a second. When you press down the shutter lever, the shutter opens and then 1/100th of a second later it snaps closed again. That’s fairly quickly! That’s about how quickly an eye blinks. You can see this setting at the bottom of the Holga. It’s labeled as N for Normal. But wait? What is this “B” setting? This is the “Bulb” setting. It is traditionally, on bulb-cameras, used with a flashbulb and allows the camera to be open for longer during bulb exposures. Here, it means you can have the shutter be open for as long as you hold down the lever. In theory this is great. In practice, when your finger is pressing down that lever it is shaking the camera. It’s going to add blur to your image. If you’re going to play with the B setting to have the shutter open for longer, I highly recommend investing in a remote shutter release. That way you can set the camera up on a tripod and then press and release the shutter remotely. 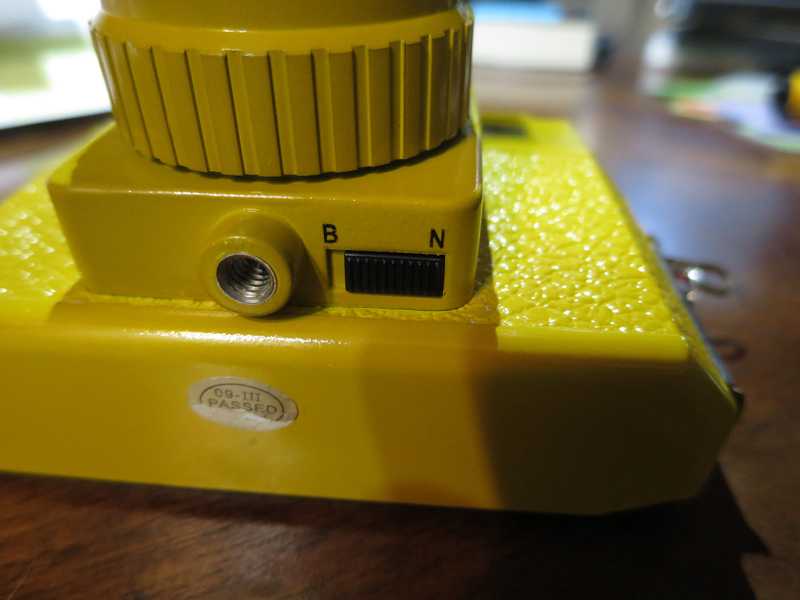 The tripod screws into the hole immediately next to the B and N button. If you’re not using this button I highly recommend taping over it as part of your taping process. That way it doesn’t switch by accident. So, to summarize, there IS a shutter speed setting on a Holga camera. However, it doesn’t let you change the shutter speed to a different number. The shutter is either going to fire at 1/100th of a second or it will stay open as long as you hold down the lever. If you opt for the “hold down the lever” option, make sure you use a tripod and a manual shutter release. That will give you the best results. Good luck, and I’d love to hear about your experiences with your Holga!